Opotiki Helicopters will fly you to the start of the world renowned Pakihi track, a spectacular downhill which is part of the Motu Trail, one of New Zealand’s most iconic mountain bike rides. Our custom bike rack allows a safe drop of your bikes and riding gear to the top of the track. Although classed as Advanced, it is also ridable by Intermediate riders of reasonable fitness. A sensational wilderness ride. For cyclists, the Pakihi track is ONE-WAY from Motu Road towards Opotiki. It is not a trail to ride at high speed. 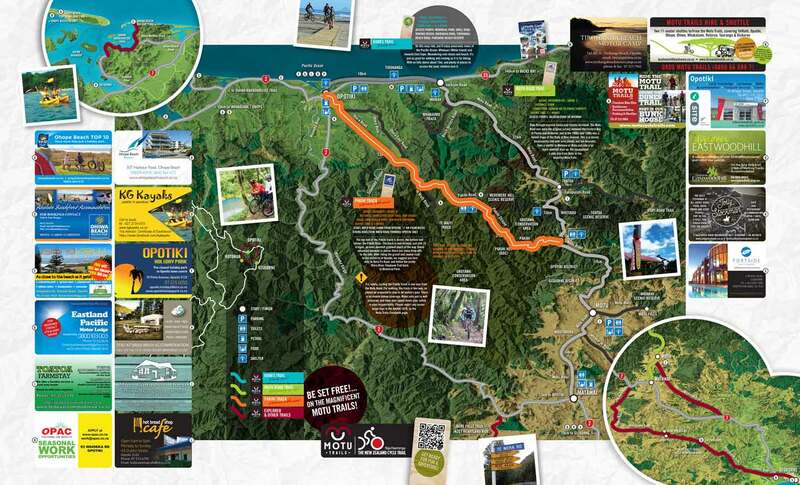 Opotiki Helicopters will drop you to the top of the track which starts 29km (about halfway) along the Motu Road Trail and includes 20km of advanced off-road riding through splendid isolation. First opened in the early-1900s, as part of a horse track from Motu down to the Pakihi steam, the largely downhill track takes you through magnificent bush, with wonderful panoramas that will demand many stops to appreciate the view. The trail crosses some 25 bridges, including a 35m swing bridge. The Pakihi Hut is located about half way down the trail and is a great spot for lunch. Pakihi Rd marks your return to civilisation with a 24km road ride through bush and farmland to Opotiki. There is also a car park at the end of the track if you prefer to be picked up, or will be leaving a car here. This is a Grade 4 trail that requires a reasonable level of fitness. While the surface is generally well formed, there are steep drop offs in sections that require a cautious approach. Pakihi Track is in remote terrain, up to 800m altitude, with little/no mobile phone coverage. Please be prepared for the back-country conditions. You can hire bikes and gear from Motu Cycle Trails in Opotiki township. Extra thermal top and leggings. Personal locator beacons (PLB) are also recommended and available for hire at the Opotiki iSite for $15 a day. While the track takes about half a day to complete, we recommend allowing plenty of time to stop and enjoy the sensational pristine wilderness. The Pahiki Hut is located half way down the track and is a great spot to stop for lunch – if you fancy lunch being cooked for you, we can arrange to meet you at the Hut and cook a BBQ for you and your crew. Accommodation is available at the Pakhiki Hut or at a nearby lodge if you want to extend your trip into an overnight experience in this beautiful remote location. $250 per person for a crew of four – includes dropping crew, bikes and gear to the top of the Pakihi track. We are also available to fly you to other tracks within the region. Contact us for more information and prices for your next ultimate biking experience.